Retailers are struggling this year. Many are facing challenges from Amazon and others are struggling to survive the drop in traffic at regional malls. The decline in sales has pushed dozens of companies into bankruptcy. On Tuesday, Toys ‘R’ Us, the toy retailer struggling with $5 billion in debt and intense online competition, joined the list of retailers entering bankruptcy this year. In announcing the filing, the company noted that bankruptcy protection would allow it to work with its creditors on restructuring the debt load that is preventing the company from growing. Company officials also noted stores will remain open through the important holiday season. Filing for bankruptcy protection “will provide us with greater financial flexibility to invest in our business … and strengthen our competitive position in an increasingly challenging and rapidly changing retail marketplace worldwide,” Chairman and CEO Dave Brandon said. Toys ‘R’ Us is at least the nineteenth retailer to enter bankruptcy since the beginning of the year. The list includes well known names like shoe chain Payless Shoe Source, children’s clothing chain Gymboree Corp. and the True Religion jean brand. In addition to financial threats, online shopping presents an existential risk to Toys ‘R’ Us. GlobalData Retail estimates that in 2016 about 13.7% of toy sales were made online, up from 6.5% five years ago. The shift comes as children turn away from toys to mobile devices and electronics. Reports indicates that Toys ‘R’ Us has struggled with debt since private-equity firms Bain Capital, KKR & Co. and Vornado Realty Trust took it private in a $6.6 billion leveraged buyout in 2005. The plan had been to take the company public, but that never happened because of its weak financial performance. 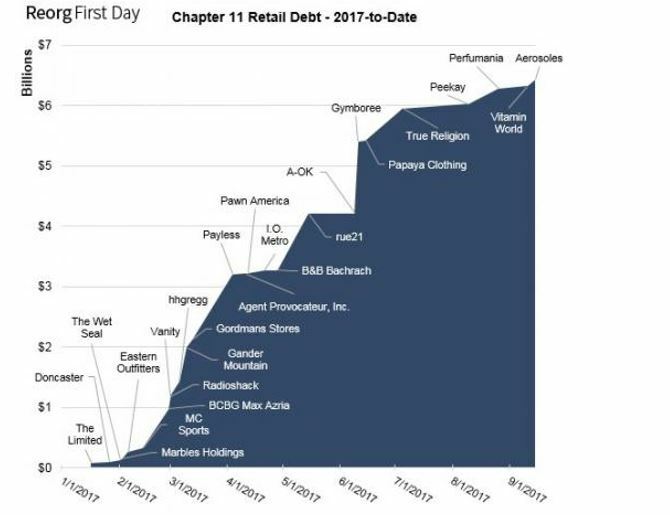 Because of the high debt servicing costs, the company hasn’t been able to reinvest in its business, leaving stores looking tired and less desirable in the eyes of consumers. Now, the bankruptcy may make the stores even less enticing to consumers. Jeffries analyst Stephanie Wissink said she expects that Toys ‘R’ Us suppliers, who were already shifting some of their orders to other stores amid talk there’d be a bankruptcy filing, will keep doing so. For most multinational toy suppliers, the Toys ‘R’ Us business roughly accounted for 10% of total sales, she said. Those suppliers are facing problems of their own. Lego is laying off 1,400 workers after saying profits and sales dropped in the first half. And the nation’s two largest toy makers, Mattel and Hasbro, reported disappointing second-quarter results. Mattel Inc. (NYSE: MAT) could be weakest supplier. Its most recent quarterly results, released in July, fell short of Wall Street expectations. The company reported a second-quarter loss of $56.1 million, or $0.16 cents per share. Analysts had expected a loss of $0.09. Worldwide sales for Mattel Girls & Boys Brands were up 10% however traders were considered that its biggest brands did not perform well. Sales of Barbie dolls were down 5%, Fischer-Price sales declined 3%, and American Girl doll sales fell 6%. Now, Mattel faces risks related to the Toys ‘R’ Us bankruptcy. Mattel is a creditor, having extending credit to the retailer as a standard part of its operations. Those loans are now at risk. In a bankruptcy, it is common for creditors to take a loss on outstanding credit. Any loss, even a small one, could have a significant impact on Mattel. Mattel is also at risk of seeing its sales through the Toys ‘R’ Us channel decrease. Some suppliers are likely to reduce their exposure to Toys ‘R’ Us, leaving shelves at the stores less than fully stocked. That could drive customers away, towards competitors like Wal-Mart and online retailers. A third risk Mattel faces is that to raise cash, Toys ‘R’ Us could deeply discount its products. This could put pressure on other retailers to match the low prices and reduce the company’s product sales. Mattel was already under pressure. Analysts responded to last quarter’s disappointment by cutting their expectations for Mattel. This can be seen in the table below which shows estimates have been cut for this year and next. These revisions have contributed to the stock’s recent decline. Mattel now faces even more pressure since one of its largest customers is in bankruptcy. This could lead to a sell off in the stock. However, even if the stock doesn’t decline much, in the short term, MAT seems unlikely to rally sharply. Traders will want proof the company can be profitable. This means traders should consider using an options strategy known as a bear put spread to benefit from the expected price move. The bearish outlook for MAT, at least for the purposes of this trade, is a short term opinion. To benefit from the tradeoff, traders can buy put options. Specifically, the October 6 $16 put can be bought for about $1.00 and the October 6 $15 put can be sold for about $0.40. This trade will cost about $0.60 to enter, or $60 since each contract covers 100 shares, ignoring the cost of commissions which should be small when using a deep discount broker. The maximum loss is experienced if MAT rises above $16. In that case, both options would expire worthless. The maximum gain on the trade is equal to the difference in exercise prices less the premium paid, or $0.40 in this trade ($16 – $15 = $1; $1 – $0.60 = $0.40). This represents $40 per contract. Most brokers will require minimum trading capital equal to the risk on the trade, or $60 to open this trade. That is a potential gain of 67% on the amount risked in the trade. This trade delivers the maximum gain if MAT closes below $15 on October 6, when the options expire. If MAT closes between $15 and $16 that day, the gain will be less than $0.40. Put spreads can be used to generate high returns on small amounts of capital several times a year, offering larger percentage gains for small investors willing to accept the risks of this strategy. Those risks, in dollar terms, are relatively small, about $60 for this trade in MAT.